This is the 2017 edition of the Dodgers Digest All-Prospect team. There are some good names on this list, and the organization is strong despite graduations from the 2016 and 2017 seasons. You’ll see one name below who isn’t still in the org, but there was no one better for the spot than … you’ll have to scroll to find out who it is. This team is based on 2017 minor-league performance and not necessarily a reflection of where they rank within the system, but age and competition level is also taken into account. There will be some guys on the second team who performed better than guys on the first team, but the second-team guys might be older, which would give the younger guys the advantage. The Dodgers aggressively started Ruiz in the cold, pitcher-friendly Midwest League. He handled things so well there that he got a promotion to the warm, hitter-friendly California League. He hit for more power with Rancho (not surprising), and he has the frame to add to that power potential. His receiving behind the plate is excellent, but he does need to work on his throwing. Oh, and he just turned 19 in July and won the organization’s Minor League Player of the Year award. This would have been Cody Bellinger but, well, you know. Beaty is your typical low-ceiling prospect who performs well in the minors. He broke out in 2017 by leading the Texas League in hitting and capturing the league’s MVP award. He was a catcher in college, but the Dodgers quickly moved him to the corner infield spots, and that’s where his future lies. Think of him as the left-handed version of O’Koyea Dickson or Rob Segedin (less power, better hit tool). Despite being dealt at the non-waiver trade deadline, Calhoun had a great season with the OKC Dodgers. He saw his power improve from Double-A to Triple-A, and saw an almost 60-point increase in his BABIP, which led to a nearly 50-point increase in batting average. He draws walks, doesn’t strikeout and can absolutely hit. He’s gonna be a great hitter for the Rangers. Our Minor League Player of the Year, Rios improved on his breakout 2016 campaign with an even better 2017 season. The biggest thing is he walked a bit more while maintaining a good hit tool and massive power. He’s at third base here because he played more than a third of his games there, but his future is likely at first base. It’s too bad because he has a plus-arm that would play great at third base or the corner outfield. The Dodgers’ 2016 6th-round pick climbed the ladder in 2017 after beginning the season with the Loons. The overall numbers aren’t overwhelming by any means, but he did some good things offensively this season. He showed good bat-to-ball skills, showed the ability to draw a walk, showed some speed and hit for a little pop (mostly with the Quakes). He profiles as a utility infielder-type, but he can absolutely play shortstop. Diaz began the season back with the Quakes and was basically repeating what he did in 2016. But a late-season promotion to Tulsa saw his production increase substantially, and it finally started to match the scouting reports that talk up his tools. He had nearly a .900 OPS with the Drillers as a 20-year-old in his first taste of Double-A. He played all over the outfield and will likely end up in a corner, but he has the ability to handle center field for a bit. He could be in line for a massive breakout season in 2018. The Cal League MVP is the easy pick here. Despite a somewhat concerning strikeout rate, he showed why scouts are excited about his future. He has massive raw power, has good on-base skills, is extremely athletic for a guy who is 6-foot-6 and can play a legit center field. If he can reduce his strikeout rate even a little while making the jump to Double-A, he could find his way onto a lot of Top 100 lists before the 2019 season. Owner of the system’s best hit tool, Verdugo performed incredibly well for a 21-year-old. He performed incredibly well for a 21-year-old … in Triple-A. The over-the-fence power is still not all there, but there’s gap power along with improved on-base ability and the best bat control in the system. He earned a late-season promotion to the majors and might be the Dodgers’ immediate future in center field. Buehler was the Dodgers’ MiLB Pitcher of the Year, and it was well-deserved. The strikeout percentage is incredible and Buehler thoroughly dominated High-A and Double-A before getting promoted to Triple-A. He got roughed up in his first start, but if you take that start out, he was really good in OKC: 3.09 ERA, .198 BAA, 35.8 K%, 8.4 BB% — basically what he ended up doing on the season. He’s gonna be a good one. I saw Ferguson’s first start of the season and was a bit underwhelmed. But aside from a bit of a rough June, he was quite effective on the season. He finished strong by posting a 2.43 ERA, .239 BAA (.370 BABIP), 32.5 K% and a 9.3 BB% over his final 10 starts. If he can go to Double-A and remain this effective (while improving his command a bit), he’s could be a borderline Top 100 prospect. He’s clearly the best left-handed pitching prospect in the org. May was the Dodgers’ 3rd-rounder in 2016 and he showed exactly why they gave him a $1 million bonus. He kept the ball down in Low-A and didn’t walk hitters while averaging about 5 1/3 innings per start. He got a late promotion to Rancho and posted a 15/1 K/BB in 11 innings of work. The Cal League will be a big test for him next season, but he’s mature beyond his years and has the stuff to succeed going forward. Our Minor League Pitcher of the Year had an amazing season with the OKC Dodgers. If he were younger, he’d be a legitimate prospect and place higher on this list. But the fact he’s 27 and has toiled (mostly) in the minors in his pro career doesn’t bode well for his future as a starting pitcher. But he has enough stuff to at least be a decent relief option, if this is the version of Font we’ll be getting from now on. Like Ferguson, I saw Santana’s first start of the season. While he wasn’t terribly sharp, he was still impressive. The velocity, movement on his fastball and slider were all standouts. After a month, he had a 1.26 ERA as a 21-year-old in High-A. He finished his time with Rancho in mid-July and got the call to Tulsa. 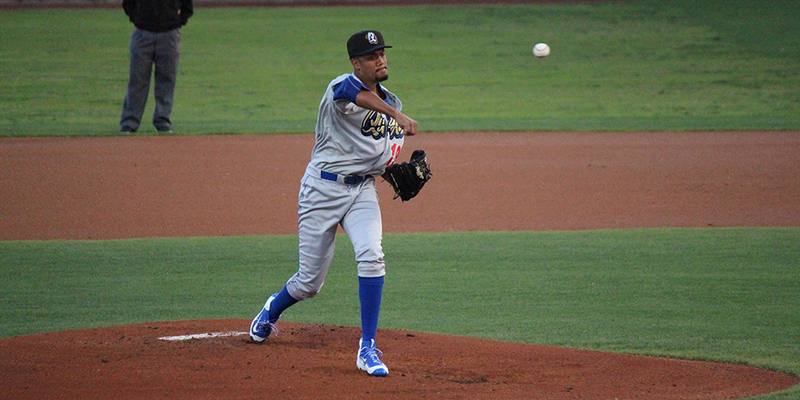 The numbers don’t look great (5.51 ERA, 14.9 BB%), but he still struck out nearly a quarter of the hitters he had a 10-strikeout game on Aug. 20 and sent the Drillers to the Texas League championship series with a 7-inning, 11-strikeout outing. After being outrighted off the 40-man roster in 2016, Sierra moved to the bullpen and thrived. So, he pitched the entire 2017 as a reliever and showed why the Dodgers gave him a $30 million contract. Sierra had a fantastic strikeout rate between Double-A and Triple-A. He also allowed just three home runs in his 71 innings pitched. His fastball has ticked up out of the bullpen and his slider is much more effective as a reliever. He should see time in LA next season. A Spring Training darling, Spitzbarth flat-out dominated the Cal League (0.57 ERA, 45.0 K%) and didn’t stay there long. He spent most of his season with the Drillers and was was pretty solid for them. He missed fewer bats in Double-A, but he was still effective. Also, not being 25 or 26 bodes well for his future. He has an outside shot of seeing LA in 2017. Long, the tallest player in the org (6-foot-10), had a highly productive season out of the Loon and Quake bullpens. His stuff isn’t overpowering, but it has played up since moving to the bullpen to begin this season. His ceiling isn’t terribly high, but he could be a fungible reliever at the next level, but 2017 in Double-A will be a big test for him. Gonsolin, the Dodgers’ 9th-rounder last season, kind of came out of nowhere to be a nearly 30 percent strikeout guy between Low-A and High-A. He didn’t pitch as well as Long, but his future is a little brighter because he has better stuff, which includes a mid-90s fastball. He’s a relief prospect to watch over the next year or two. The last time the Dodgers had a minor in Low-A, his name was Julio Urias. Jimenez isn’t the next Urias, but he has some premium stuff (mid-90s fastball, hammer curve) with, unsurprisingly, spotty command at this time. He skipped over Ogden, which means the org thinks it may have something in this kid because they didn’t subject him to the Pioneer League. The strikeout rate is the most impressive of the stats listed above. He’s gone from “deep sleeper” to just “sleeper” after a strong (albeit brief) 2017. That’s it for the All-Prospect team. Look for most (all?) of these guys on my Top 100 list early next year. You know, as long as they’re still in the organization.